The statue is named Tian Tan Buddha because its base is a model of the Altar of Heaven or Earthly Mount of Tian Tan, the Temple of Heaven in Beijing. One of the five large Buddha statues in China, it is enthroned on a lotus on top of a three-platform altar. Surrounding it are six smaller bronze statues known as "The Offering of the Six Devas" that are posed offering flowers, incense, lamp, ointment, fruit, and music to the Buddha. These symbolise the Six Perfections of generosity, morality, patience, zeal, meditation, and wisdom, all of which are necessary for enlightenment. 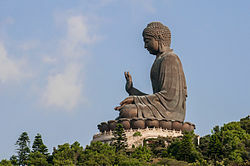 This article uses material from the Wikipedia article "Tian Tan Buddha", which is released under the Creative Commons Attribution-Share-Alike 3.0 License.